Chris Fischer plans to source the restaurant with food from his family's farm, Beetlebung Farm in Chilmark. It’s out with the white linen table cloths and in with the repurposed wood as the farm-to-table movement anchors itself in Chilmark this summer. Farmer and chef Chris Fischer will take the helm of the restaurant at the Beach Plum Inn in Menemsha, the inn announced this week. Mr. Fischer will source directly from his family’s farm, Beetlebung Farm, just over a mile down the road. The restaurant will open sometime next month. By growing food directly for the restaurant and building a chicken coop on site, among other plans, Mr. Fischer said he aims to take the farm-to-table label to a new level of commitment. He plans to split his time between the restaurant and the farm. In the past few weeks Mr. Fischer has been hard at work transforming the dining room that looks over Menemsha harbor, opening the kitchen to public view and redoing ceilings with repurposed wood from an old barn. A new chef’s table and banquettes are also in the works, as well as featured artwork from Island artists. 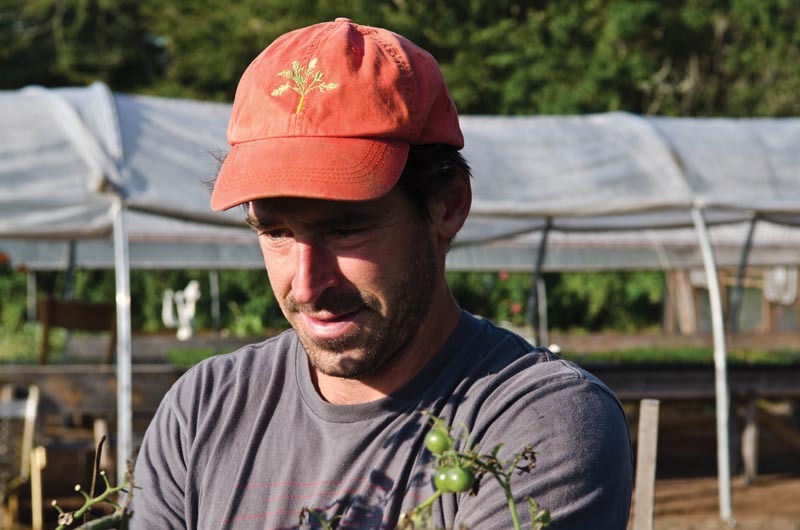 Mr. Fischer returns to the kitchen after six years of operating and managing Beetlebung Farm. Prior to the farm, Mr. Fischer worked at acclaimed New York city restaurant Babbo under Mario Batali for several years, also cooking in Italy and London. Mr. Fischer returned to the land his family has farmed for generations in 2009, farming and privately chefing. The Chilmark native worked alongside his grandfather and longtime farmer Albert O. (Ozzie) Fischer Jr. until his death two years ago. Mr. Fischer writes a food column for the Vineyard Gazette. Beach Plum Inn owner Sarah Nixon said she and her husband Bob are excited about the new venture. “It’s the beginning of the Chilmark renaissance,” Mrs. Nixon said in a phone interview. Mr. and Mrs. Nixon also own the Menemsha Inn and the Home Port Restaurant, just down the hill. The Home Port is also welcoming a new chef this year. Former Atria chef Matt Safranek and wife Angela Vezzose will run the longtime institution, which opens Memorial Day weekend. “It’s the beginning of the Chilmark renaissance,” Mrs. Nixon said in a phone interview. The town's modestly moribund nature has always been one of its appeals. Don't tinker too much. Great. Congratulations to Chris, a hardworking and talented native son. Now if he could just get the Nixons to rehab the Home Port. It has been crying out for a makeover for the last twenty-five years or more. yeah, visions of a chilmark renaissance -- kim kardashian in a leather maternity dress teetering around on her stilettoes -- inspires little pleasure. the persistence of the young man and his finding a way to keep the family farm going inspires a great deal of pleasure. Excellent news! This will absolutely transform the Beach Plum experience, for the better. Congratulations to Chris! Look forward to visiting. We have been enjoying Chris's cooking and his farm produce for several years now and are wildly excited that the Nixon's have given multi-talented Chris a free hand here, in both his cooking and his vision for the dining room. And the sourcing of food from Beetlebung and other farms is so long overdue in the Vineyard restaurant scene. Cheers and congrats to all of you and when are you opening up the reservations book? Way to go Chris! Best of future to you and Beach Plum, looking forward to a visit in the future. Sounds great; hope it is affordable. We have spent many wonderful hours at the Inn's Dining Room in the past during our boating years. We are looking forward to the pleasure of Chris's delicious honest cooking with no foufou whatsoever. Brilliant choice on Sarah and Bob's part. Great decision for Chris. Save our table. Fantastic news! So great to have Chris bringing his family's history and produce to the beach plum - will surely be transformational and for the better. Looking forward to dining this summer! Wonderful, looking forward to some kale salad! A great continuation of your family roots. We're ready to make a reservation now!